Mind Shakers- For Every Indian! This is perhaps something that the people of our nation do not get to read so frequently about the Digital India Concept, it was proposed by our Prime Minister Narender Modi and just after International Yoga Day 2015, now he is going to inaugurate “Digital India Week” in New Delhi, as the date 1st July have great importance in the history of Advanced Computing in our nation. In the weeklong event various products like e-sign etc, will also be initiated during the programme as the purpose of Digital India Concept is to make Technology as an upbringing tool to impose positive changes. The e-sign product provides the citizen of India a relief as now the people could sign there instant documents online in a secure and legal form. iii) Good governance and services on demand. 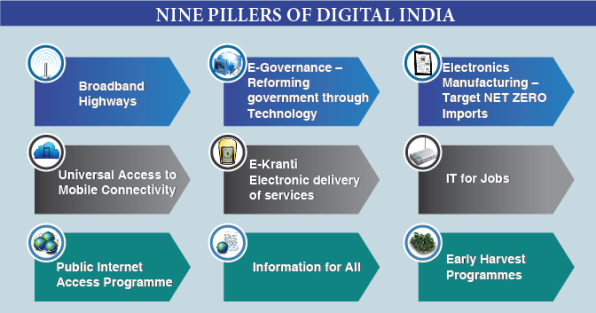 The objective of Digital India Programme is to transmogrify India in an economy with digital empowered society having valuable knowledge. In the event other activities will include in-house campaign, media briefing, presentation and exhibition of various products. Apart from the event various other organisations will sensitise and inform the people about the ongoing activities on Digital India platform throughout the country. The officials of our Government are expecting huge investment during the week in India. Various market and Business leaders of India and the world will also be participating in the event which includes Airbus India CEO Peter Gutsmiedl, RIL Chairman and Managing Director Mukesh Ambani, Tata Group chairman Cyrus Mistry and various other. 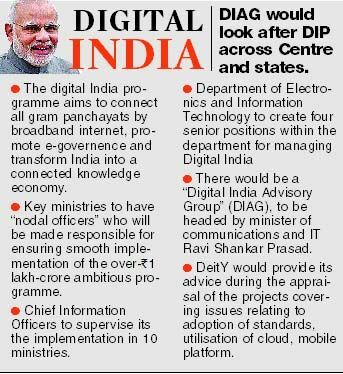 The monitoring committee on Digital India consist of Prime Minister being the Chainman of the committee. Narender Modi will present the Government future plans and the roadmap for digitising India at the inauguration programme which is expected to be attended by 10000 guests. Playing online casino games is very fun. best online casino real money Games are not bad if you know how to win.